Fast action instantaneous relay - 4 CO contacts, 5 A. * permanent eneggization of the coil without consequence on the relay's reliability. 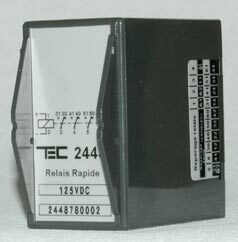 * 0,15 A / 220 VDC / L/R 50 ms = 1000 operations. * Electronic components giving fast peak up response <= 5 ms of the 4 NO contacts.